Even the Indian team had celebrated the same way after winning the ODI series in New Zealand. Vidarbha won their second successive Ranji Trophy title on Thursday beating Saurashtra by 78 runs in the final at VCA Stadium in Nagpur. Last season, they defeated Delhi in the final and with this win, became the first team since Karnataka to win back-to-back Ranji titles. Karnataka had won in the 2013-14 and 2014-15 seasons. 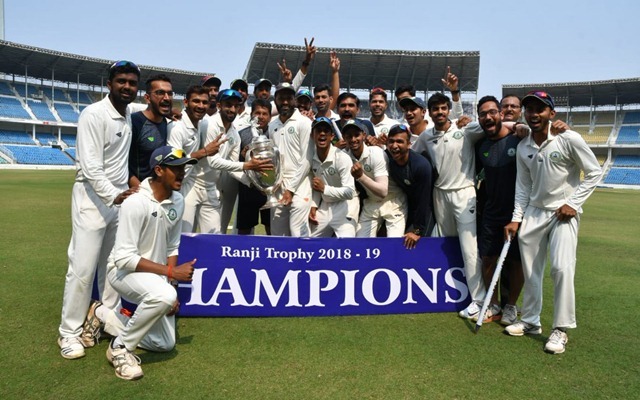 Chasing 206 to win their first trophy since 1944 (when they played as Western India), Saurashtra folded for 127 on the final-day wicket with left-arm spinner Aditya Sarwate picking six wickets for 59 runs to follow up his 5/98 in the first innings. Star batter Cheteshwar Pujara, hero of the semi-final game against Karnataka, failed to deliver in the game, managing 1 and 0 in the two innings. This is the third time since 2012-13 that Saurashtra failed in the Ranji Trophy final, twice against Mumbai and now against Vidarbha. Vidarbha players were not complaining though. After winning the game and getting their hands on the coveted trophy, the champions posed for a group photo and as somebody shouted “Who is the champion?” and “How is the Josh” of ‘Uri’ fame, the players shouted: “Vidarbha” and “High sir”, respectively. Recently, even the Indian players celebrated the same way replicating Vicky Kaushal‘s dialogue from Uri movie and the video had gone viral. The hosts needed just five wickets on the final day after Saurashtra lost half their side for just 55 runs on Wednesday and the target of 206 looked uphill for them. The 20-year-old Vishavraj Jadeja was their only hope with 52 but his efforts fell far too short to guide his side home.